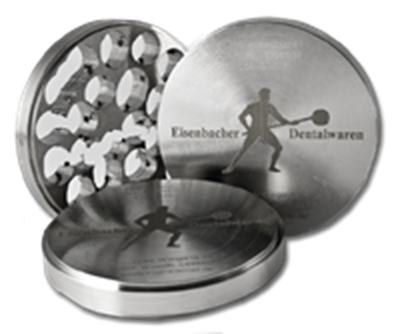 Axsys is proud to offer non-precious metal CAD/CAM Blanks from Eisenbacher Dentalwaren ED GmbH. From their modern production facilities located at the periphery of the Rhein-Main-area, near Frankfurt Germany, their motivated employees are producing alloys, plaster, blasting abrasives, and investing for dental technicians all over the world. Their products have to meet the highest standards of quality and function. Eisenbach maintains a quality system according to ISO 13485 / DIN EN ISO 9001:2008 to assure consistent quality through proven manufacturing and controls on each batch. Non-precious dental alloys by Eisenbach dental products are high purity and exclusively produced with "fresh" pre-tested raw metals. This is an important qualification for high fabric compatibility. The manufacturing methods and compositions of the dental alloys are in accordance to all relevant norms (EN ISO 22674:2006). Titanium and Cobalt Chrome as a coping material for metal ceramic restorations has received attention in dentistry, with the idea that it could be used as an affordable alternative for expensive precious metal alloys. Despite the long-term clinical success of restorations using precious metal alloys, the increasing price of gold has become a significant driving force to seek alternatives. Besides its lower cost, other characteristics of titanium, such as its excellent biocompatibility, high corrosion resistance, low specific gravity, and appropriate mechanical properties, are appealing to clinicians. 99.5mm (98.3mm with step) Grade 5 Titanium CAD/CAM Discs. Biocompatible, Grade 5 discs with 760-850 MPa Yield Strength. 99.5mm (98.3mm with step) Grade 4 Cobalt Chrome CAD/CAM Disc. Biocompatible, Type 4 discs with 380 MPa Yield Strength.